To test the ever-advancing state of the art, Bosch invited us to its proving ground near the Motor City to try the newest generation of electronics on the 2015 Ducati Multistrada S, which is equipped with the Combined Braking System (eCBS), Ducati Wheelie Control (DWC), Rear Wheel Lift Control, and Ducati Traction Control (DTC). But the big news is the introduction of Cornering ABS, a.k.a. Motorcycle Stability Control (MSC). 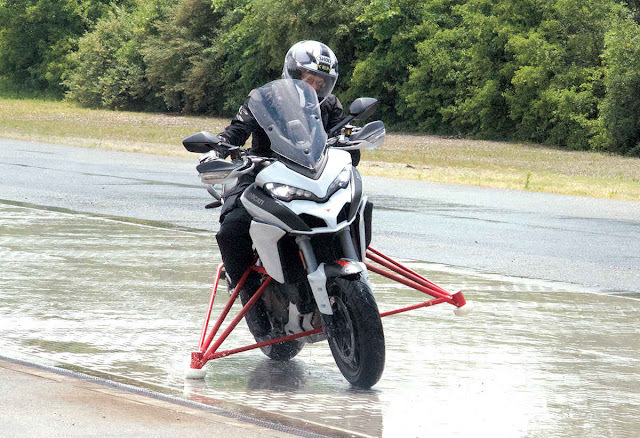 To test the Bosch ABS we made several high- and low-speed runs on various surfaces, including wet and dry pavement and gravel. As expected, the bike remained upright even with copious amounts of brake pressure. The system cycled rapidly, instilling good control and confidence. To test extreme traction limits, we did several passes on a tile runway that was drenched with sprinklers, riding bikes outfitted with sturdy outriggers. With ABS switched completely off, traction was lost with just a touch of the brakes and the bike slammed onto the outrigger. Next, we did several wetted-tile runs with ABS switched on. Even stabbing the brakes the bike remained balanced on two wheels. Beautiful! Where the ABS (and TC) worked as expected in a straight line, cornering ABS defied all logic. Bending into turns at up to 35 degrees of lean and then applying massive brake pressure only resulted in the smooth, controlled arc of the turn continuing without drama. As much as we dislike cliché phrases such as, “The future is here,” it’s pretty hard to argue with results like this. 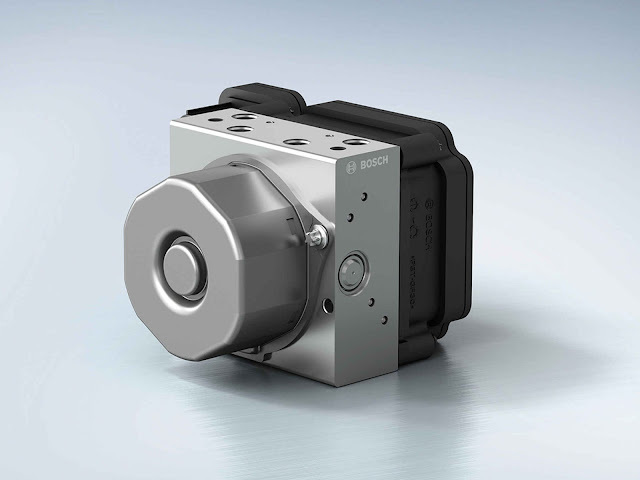 Three versions of the Bosch ABS/MSC units are available for manufacturers to choose from, each optimized to suit various types of motorcycles and their intended use.